Jacobean homes date back to the reign of King James I of England, which many believe to be the second phase of Renaissance architecture. Built in the early 1600s, over 400 years later these homes continue to be highly sought-after from local, national and overseas buyers. Valued because of their rarity, decorative features and grand proportions, you would be hard-pressed to find a buyer who doesn't love a Jacobean style home. Rich, both in history and design, Jacobean properties are often very large, stately homes that boast elaborate and intricate features, such as ornate ceilings and beautifully carved wooden features on fireplaces and staircases. The exteriors are always easy of the eye, with properties constructed from brick and offset with stone mullion windows, gable frontages and tall chimney pots: grand English architecture at its finest. It is rare however to find a Jacobean property that hasn't been adapted in some way to suit our 21st century style of living. Many of these homes have now been lovingly restored to include luxury modern kitchens and bathrooms, but do still retain key original features such as grand staircases and carved internal panelling which continue to wow and attract potential buyers during a viewing. Located in this Grade II* listed Jacobean hall is a two bedroom apartment available for £409,950 through our Northampton branch. 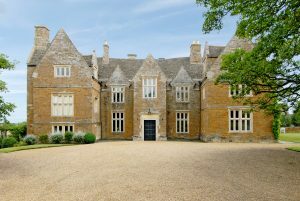 For those looking for a more affordable way to buy a slice of history, many of these mansion style homes have been carved up into beautiful, smaller properties, such as this two bedroom apartment in Grade II listed, Loddington Hall, in Northamptonshire. This often means that the owner can live in a home that is the right size and style for them, and still benefit from surrounding features such as extensive communal gardens, swimming pools and tennis courts. However, as many Jacobean homes crop up on the land that had been gifted by the king to his courtiers or include important historical features, they do tend to be listed and so renovations can be tightly controlled. This is not to say that changes cannot be made to the property, but owners would need to be prepared to work within the confines of English Heritage. If, as a country, we are to preserve these fascinating pieces of British history, time spent on reconnaissance and assessing the works to be undertaken will rarely be wasted.